Get in touch with your inner Tarzan, and join us for this tree top adventure. 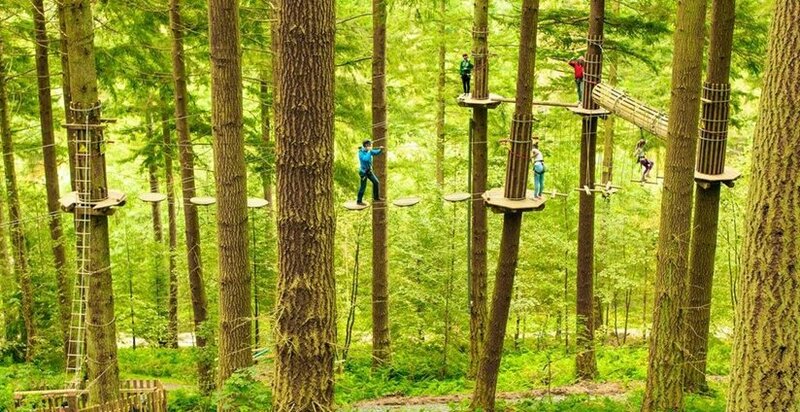 Go Ape offers two to three hours of tree top high wires, tricky crossing (using ladders, walkways, tunnels) and of course flying through the air on the zip wires and Tarzan swing. This adventure normally costs £30, but we will do it for £25 which will include transport there and back. We need drivers for this event so let us know if you can. Meal provided? : No, but you can buy food in the place, or bring along some lunch. Gear: We suggest that you wear something you don’t mind getting grubby. Dress for the weather so bring along a mac if it’s raining! Make sure your stomach area is covered. Please wear appropriate footwear with soles with good grips. No sandals or slip-off shoes. You’ll need closed toe and heel shoes (with flat soles). We recommend gloves. Long hair must be tied back. This entry was posted in Blog, News, Social event and tagged abbey, adventure, ape, go, ladder, line, park, rope, tree, Woburn, zip.